In a saucepan over medium to medium high heat, bring rice, water, lemon rind and cinnamon sticks to a boil; reduce heat to low and cover. Simmer for 10 minutes or until rice is tender. Once rice is tender, remove lemon rinds with a slotted spoon. Over low heat, gradually add evaporated and sweetened condensed milk, stirring constantly to ensure rice does not stick. Add salt and vanilla extract, stirring constantly. Cook and continue to stir for approximately 7 to 10 minutes, until mixture thickens, to desired consistency. Remove from heat and allow cooling before storing in refrigerator covered. Margo used to say the secret to great arroz con leche is soft rice! She always let her rice soak in water for at least two hours before beginning the recipe. When I think of a no-bake dessert, I think of opening up our refrigerator and seeing ramekins of Cuban arroz con leche lined up, waiting to be enjoyed. My great grandmother Margo loved arroz con leche and her Cuban recipe was the best in town: simple, sweet and made with love. Enjoy this dessert warm, for an after dinner treat. Or, like my great grandmother used to do, enjoy it cold for a refreshing sweet confection. This is a thicker version of commonly made rice pudding, and sweeter. 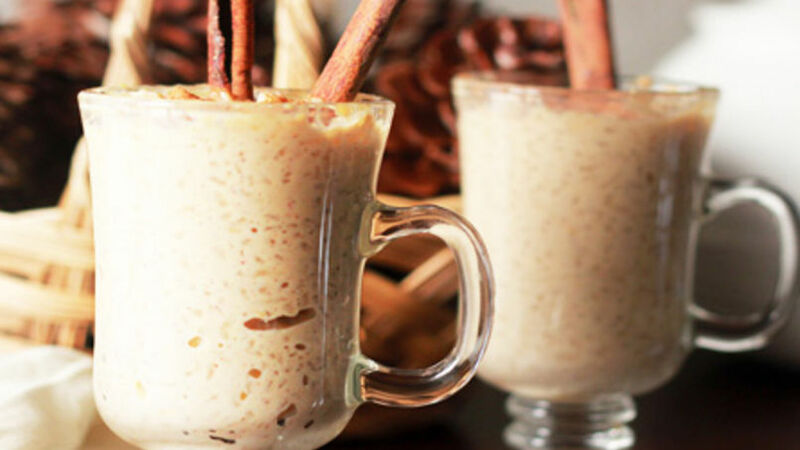 Either way, this arroz con leche will be sure to put a sweet smile on your face.